Great Location! This spacious studio condominium has all of the comforts of home. This condo is perfect for an active family vacation or a couple looking for a romantic getaway. The living area has a new Queen Sofa Sleeper with a Flat Screen TV, cable, DVD player. High Speed internet is provided. The studio is furnished with a King Bed. The kitchen is equipped with dinnerware to serve four. This condo also has full sized appliances, microwave, cookware, coffee-maker, toaster and a blender. 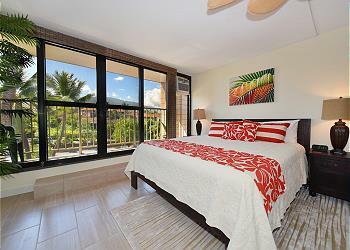 A studio unit that is 100% remodeled and newly decorated. All appliances, furniture, floors, bathroom are brand new. Great oceanfront property with sunsets nightly, whales, turtles, swimming, and BBQ's. Close (walking distance) to shopping, farmers market, restaurants, grocery stores, and includes beach equipment for your use. Near Kaanapali Beach, Kapalua and Napili Bays for snorkeling and beach activities. Doesn't get better and at these prices this studio is a must see.